CD review: "Because of You"
Teen heartthrobs don't generally fare very well down the road  see Leif Garrett and Shaun Cassidy as examples. But every once in awhile, a one-time bobby-sox idol manages to age with grace and surety. Sinatra, the original matinee idol, became a crooner of the highest order long after girls had stopped screaming for him. 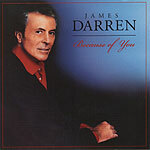 James Darren seems to be following that path to graceful maturation. The one-time hunk who starred opposite Sandra Dee in the original "Gidget" and recorded a series of bubble-gum hits in the late '50s found his way to the jazz canon via Star Trek, of all vehicles. By the late-'90s, Darren was a successful TV executive, directing and producing "Beverly Hills 90210." But a chance to play the holographic Vegas lounge singer Vic Fontaine on "Star Trek: Deep Space Nine" came along, and Darren nailed the role so solidly, even to the singing, that Concord Records offered him a contract. His first recording in years, "This One's From the Heart," came out two years ago and wowed audiences and critics alike  to the point that Darren went from playing an imagined Vegas lounge singer on a TV show to, well, playing Vegas to sold-out shows. The bubble-gum pop of his youth was gone, replaced by the kind of world-weary yet optimistic jazz singing Sinatra made his own. This is music for reading Hemingway to, the type of performance Bogie might have featured at Rick's. No mere clone of those who've come before, Darren leaves his own imprint on songs like "A Nightingale Sang in Berkeley Square," "I'm a Fool to Want You" and "My Old Flame." Darren is so confident a singer, so comfortable in his new role that he can even tackle songs like "Can't Take My Eyes Off of You" or "More Today Than Yesterday"  material that could be (and surely has been) pure dross in lesser hands  and turn them into legitimate jazz pieces. As with Sinatra and Bennett, Darren (who like them is also of Italian descent) is not possessed of the greatest voice. His range is limited, his tone riddled with impurities. But he also resembles both Sinatra and Bennett in his ability to turn his voice's imperfections into strengths  his ability to convey regret and heartache rivals the very best. This is the voice of a man who has known defeat and disappointment, yet perseveres. The fact is, Sinatra wasn't beloved by middle-aged men because of his success  rather, they were willing to forgive him his looks and way with women because through his art he made clear that he had known the same failures as any of us; greater failures, even. Darren, too, possesses that ability to make you believe that he understands us, that he shares a common man's fears, that he carries scars of his own. Darren carries the mark of true artistic greatness  that rare ability to convey a common touch.